John Wright * (sometimes known as Mr. Right) (born 1962) is a Canadian musician and songwriter. 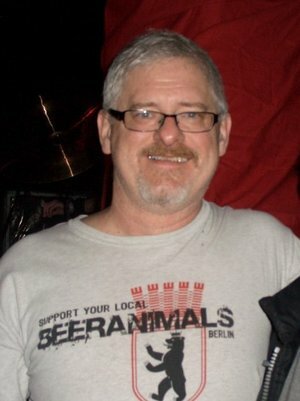 He is best known as the drummer, keyboardist, occasional vocalist and co-songwriter in the progressive punk rock/punk jazz band NoMeansNo, as well as the lead singer and co-songwriter of the pop-punk group The Hanson Brothers. Both groups also feature Wright's older brother Rob and guitarist Tom Holliston. He has also performed in noted Canadian punk groups D.O.A., the Showbusiness Giants, and the Infamous Scientists. He is currently the songwriter and "musical director" for Compressorhead, a collaboration with Berlin-based artist Frank Barnes consisting of a "band" of robots that play real instruments. There's no doubt that it's more exciting for audience to see what the drummer's doing and you feel more connected to the rhythm section that way. I mean that was standard set up in the old days – rock n' roll was the oddball that put the drummer in the back.